G. Ray Bodley High School Principal Donna Parkhurst announced that MaKenna Cealie has been named a Commended Student in the 2015 National Merit Scholarship Program. MaKenna Cealie, center, a senior at G. Ray Bodley High School, was named a Commended Student by the National Merit Scholarship Program. Cealie is among the top five percent of more than 1.5 million students who entered the scholarship competition. She is pictured with GRB Principal Donna Parkhurst and Matt Goodnough, GRB high school guidance counselor. 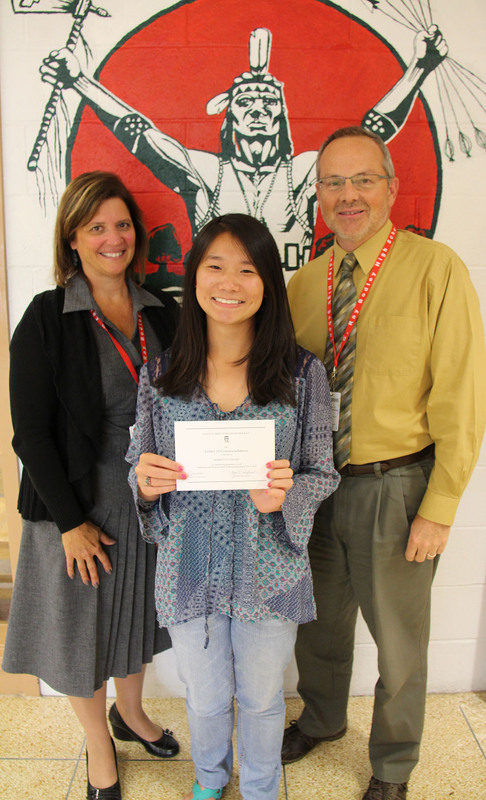 A Letter of Commendation from the school and National Merit Scholarship Corporation, which conducts the program, was presented by Parkhurst to the scholastically talented student at the school. About 34,000 Commended Students throughout the nation are being recognized for their exceptional academic promise. Although they will not continue in the 2015 competition for National Merit Scholarship awards, Commended Students placed among the top five percent of more than 1.5 million students who entered the 2015 competition by taking the 2013 Preliminary SAT/National Merit Scholarship Qualifying Test. Cealie, a senior at GRB, is the daughter of Denise Cealie.